Pedro Friedeberg wood sculpture "Señorita Geométrica"
A sculptural wood miniature table by celebrated Mexican surrealism artist and designer Pedro Friedeberg, circa 1970s. In a less common and desirable silver leaf finish and features three connected feet supporting the palm. Signed to underside "Pedro Friedeberg". Age appropriate wear and patina on surface as shown. The sculptor and painter Pedro Friedeberg works in a richly detailed, surreal and eccentric artistic style that blends influences from neoclassical art, M.C. Escher and native Mesoamerican symbolism. He is best known for his Hand chair — a functional sculpture that is an icon of design-as-art. Friedeberg was born in Florence to German parents and moved with his mother to Mexico at the outset of World War II. As a university student in Mexico City in the 1950s, he initially studied architecture, but his designs for fantastical buildings ran afoul of his rationalist, Bauhaus-oriented teachers. By chance, his drawings came to the attention of Mathias Goeritz, the German-born avant-garde painter and sculptor. He encouraged Friedeberg and made him a protégé. Friedeberg credits his mentor for instilling in him a fanatical attention to detail in his work. Friedeberg produced his first Hand chair in 1961, and has since created numerous iterations. He has also made several variants using other human limbs in different functional forms such as tables and clocks. While Friedeberg’s sculptural pieces have a gentle character that is sometimes described as spiritual, his paintings are something entirely different. He employs deep perspective to create hypnotic, painstakingly rendered canvases that suggest rooms and cityscapes. Whatever the medium, Friedeberg’s work is arresting and instantly recognizable. The Hand chair, though familiar, remains a captivating piece — both furniture and artwork — that stands apart in any interior. Examples are often priced between $20,000 and $30,000, depending on formal variations (such as a foot-shaped pedestal), material and condition. Smaller functional items such as tabletop clocks bring about $9,000. His paintings and drawings require space; they are meant to be contemplated. Prices on original examples start at about $30,000; prints generally sell in the region of $900. As you will see on these pages, the art and design of Pedro Friedeberg is singular and memorable. 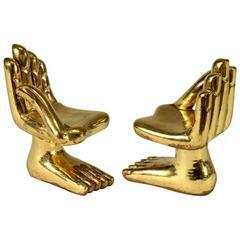 A nicely done sculpture in wood of a Pedro Fiedeberg hand chair which we had clad in Brass. Nicely done, with some surface imperfections due to the contour of the underlying wood. 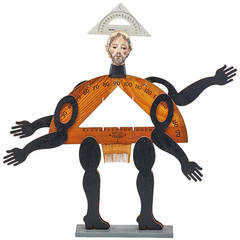 Pedro Friedeburg Sculpture "Palacio Bioenergetico"